Moyers Lawn Service & Landscaping is a family-owned, full-service yard care company that provides area customers with the best lawn care and landscaping services. Owners, Dale, Peggy, and Greg Moyers, a brother/sister trio, started their business while attending high school in 1981. Operating out of the back of an old Volkswagen, they consistently and determinedly completed their task. Word spread and in a short period of time, clients were eagerly recommending these "young entrepreneurs." Today, they enjoy a record number of satisfied customers. If your goal is a yard that expresses your own tastes, why settle for ordinary yard care services? Especially, when there's Moyers' Lawn Service and Landscaping. Whether it's mowing, yard clean-ups, turfgrass management, landscaping, or drainage correction, you'll appreciate the advantages of our approach and the myriad of yard care services we provide. The quality of lawn maintenance and landscaping service you get varies widely from business to business, and choosing inexperienced or unqualified contractors often leads to poor and costly results. 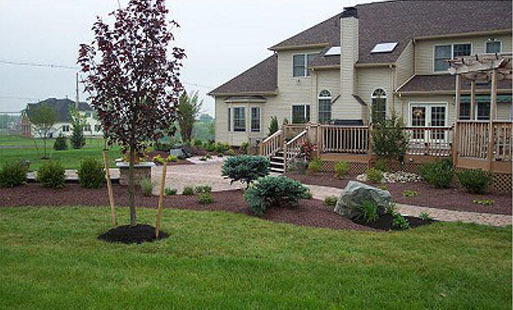 At Moyers' Lawn Service and Landscaping we have established ourselves as a professional and quality-focused landscaping company with a strong record of providing 100% customer satisfaction. Serving home and business owners in Montgomery County, Maryland and Northwest, DC, we have developed a reputation for reliable and affordable lawn and landscaping services. Our services include: Lawn Mowing, Lawn maintenance, and Yard Maintenance, Landscaping, Hardscaping, and Drainage Correction. No job is too small or too big for our experienced and dedicated landscaping crew. So whether your needs are residential or commercial, call us at 301-251-9822 or request a Free Estimate from our website for all your landscaping needs Moyers is fully licensed and insured. Please call us at 301-251-9822 or request a Free Estimate for all your lawn and landscaping needs. At Moyers, the only corners we cut are on your lawn!